It all happened because my Mom got cancer - Coach & Grow R.I.C.H. …my mom Barbara was diagnosed with bone marrow cancer. …But the truth is, trying to run my business remotely, to coach and manage all of my clients, especially with all of the inevitable rescheduling and time zone mix-ups, was way more stressful and challenging than I expected. If you’ve ever cared for an ailing loved one I bet you can relate. Something had to change. I realized that I needed to leverage my time better and create a scalable business so I could have the freedom, flexibility and income that would allow me to be there for my family. So instead of scheduling 3 private 45 minute sessions with each of my individual clients, I started coaching my clients in groups and ended up figuring out a way to generate 6-figures coaching only 6 hours/month. My mom ultimately passed away, but it was only because I created a leveraged coaching model that I was able to be there in New York and take care of her the way I wanted to and not lose my business. Since then countless numbers of coaches and other heart-based entrepreneurs have asked me how I did this, so I created a blueprint and video that maps it out for you. Download the blueprint and watch the video here. I want you to be able to create the kind of coaching business that allows you to be there for your loved ones and gives you all the time, money and freedom that you should have and deserve. In the blueprint you’ll see how you can make a much bigger impact and income by actually coaching a lot less. I share exactly how I was able to bring in 6-figures coaching only 6 hours per month and walk you through the 5 key steps so you can start designing your lucrative and leveraged coaching business. Plus you’ll find out the #1 thing you MUST do to take a huge step forward… And it’s actually something you can do today in less than a minute! Get the free blueprint and watch the video today. P.S. I’d love to know your reason, your “Big Why,” for wanting to create a more lucrative and leveraged coaching business. Please post a comment on the download page and share your “Big Why” with me. 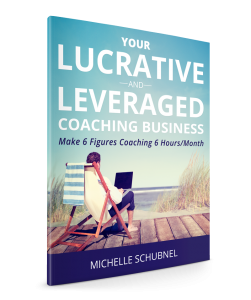 “I hired Michelle when I first launched my coaching business. I appreciated her sense of humor and fun, and was impressed by the CAGR system and Michelle’s marketing knowledge. One of the biggest benefits of working with her learning how to adapt the CAGR marketing principles to my specific business needs.